The folks who call Hondo home are convinced they live smack-dab in the middle of God’s Country. They love their little slice of heaven and frown upon any who drive through town like the devil. Thus their unusual Welcome sign that has cautioned motorists since 1930: “This is God’s Country. Please don’t drive through it like hell.” And they mean it! The Hondo Welcome sign is likely the most photographed site in town and the catalyst for many a conversation among folks passing through town. 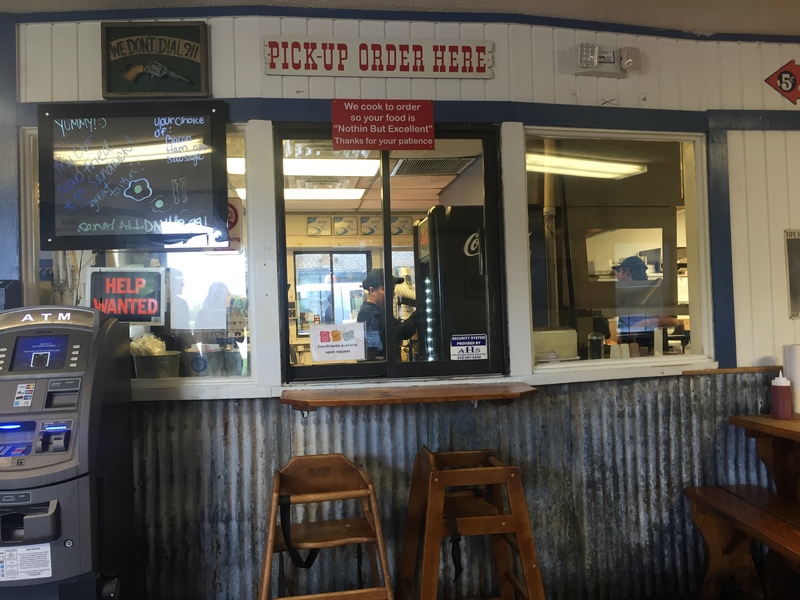 There is, however, something else to talk about when it comes to Hondo, and that is Billy Bob’s Hamburgers — a local burger joint that has been serving up some of the tastiest burgers in Medina County since 1990. Some friends and I decided to give Billy Bob’s a try on our way back to Katy from a week of adventuring on the Devils River. To say we were hungry would be an understatement. We had burned enough calories to justify eating any burger on the menu. And there are quite few offerings on Billy Bob’s menu. 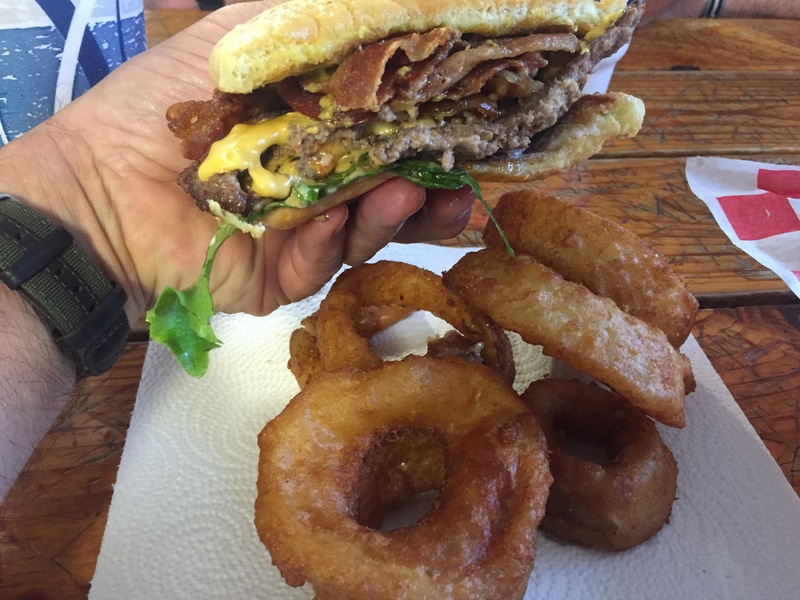 One of my buddies and I decided to order the Giant Heart Attack burger with two sides of beer-battered onion rings and a tall glass of tea. This enormous burger boasts one pound of meat, bacon, lettuce, tomato, pickles, onion, mayo, mustard, and ketchup. When the burger arrived at our table I could understand how it got its name. This thing was huge! Knowing this would be a big burger, I asked to have it cut in half. 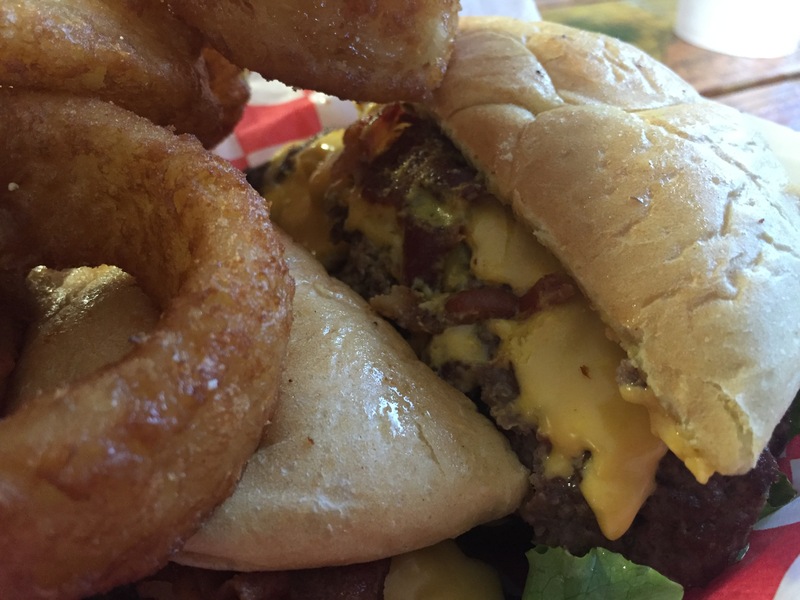 There is something beautiful about cutting a big old burger in half and appreciating the layers of goodness — kind of like a geologist looking at the strata of a west Texas hillside. Four layers of meat, all the fixings, and a moist bun. This was burger geology at its best. As for the first bite — amazing! Billy Bob’s lived up to its “nothin’ but excellent” motto. This was one exceptionally good burger. The onion rings were also delicious, a good balance of crispness covering perfectly moist onions on the inside. The entire meal was satisfying. Billy Bob’s has certainly earned a top ranking on my list of great burgers in the Lone Star State. 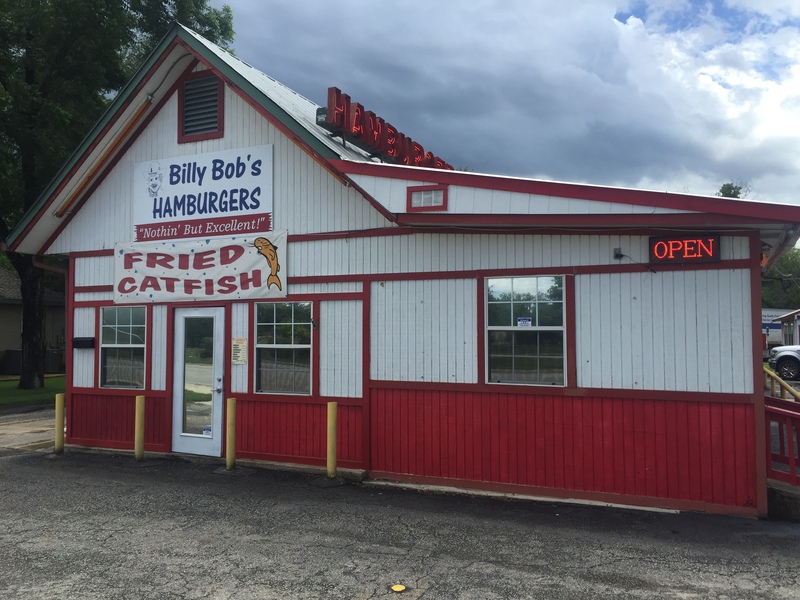 If you love a good burger, look beyond the fast food joints to discover places like Billy Bob’s. We are fortunate to have so many places to eat great burgers in Texas. Life is too short to waste our lunch hours eating at fast food chains. 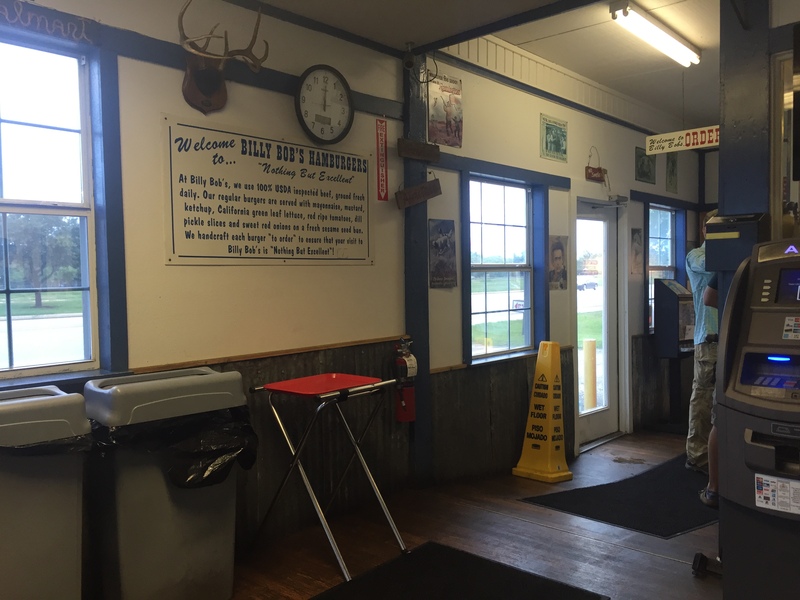 I prefer the better and more adventurous options of eating at places like Billy Bob’s. And, honestly, I think you will, too. 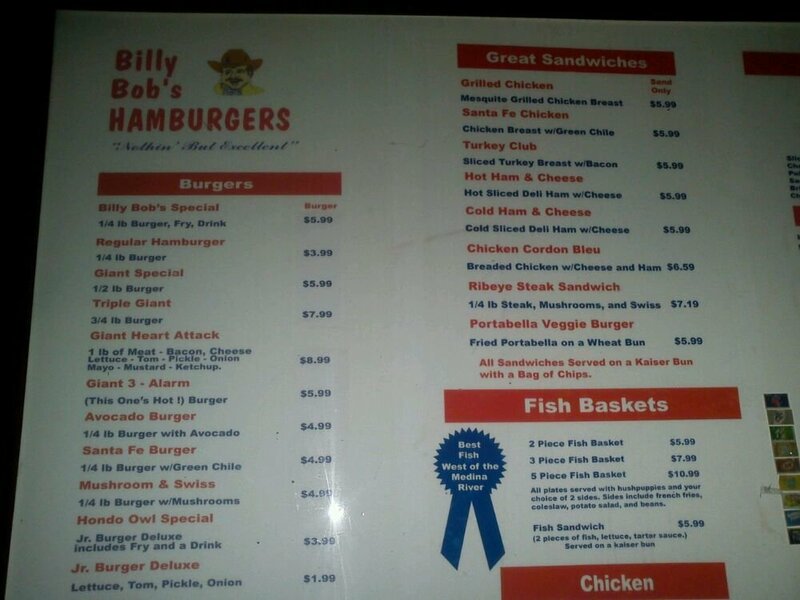 This entry was posted in Places To Eat and tagged Billy Bob's Hamburgers, Burger Joints, Hamburgers. Bookmark the permalink.